With unwavering determination and drive, Carolyn Mesara lived a life rich in family and service to others. Carolyn was heart-centered and committed. As such, she could prove feisty when taking a stand for those she loved. 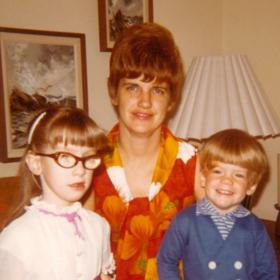 A devoted wife, mother, and friend, Carolyn was a generous caretaker for many. She gave willingly, loved freely, and was a powerful inspiration and role model for many. With the re-arming of US forces, the strains of the Great Depression began to ease. Americans’ incomes grew, and their increased spending further fueled the economy in 1940. In the US, the optimism of leaving the depression behind inspired the making of several classic movies including "Gone With the Wind" and the "Great Dictator," while the invigorating sounds of Benny Goodman and Count Basie’s jazz filled our homes with hope. Newly invented nylon stockings were all the rage with women, and FDR was elected for an unprecedented third term. Despite the ominous winds of change blowing in from Europe, the foundation of hope and generosity our nation had firmly rooted itself in as a result of the preceding decade’s hardships, could not be shaken. It was within this overwhelming feeling of fortitude, generosity, and hope that William and Dorothy (Stuart) Pauch, of Detroit, MI, welcomed their daughter Carolyn into their hearts and home on September 3rd. Growing up in Detroit during the 40s and 50s, Carolyn experienced a childhood firmly rooted in family values and community service. While her father provided for the family through his work as a truck driver, her mother worked as a dry cleaner and a homemaker. Carolyn learned to sew at an early age and enjoyed working to make her carefully stitched creations. As a teen, she enjoyed roller skating and participating in the International Order of the Rainbow for Girls where her natural passion for service was channeled into valuable service projects. It’s hard to pinpoint the exact moment Carolyn met the love of her life, Bruce Mesara, as they grew up across the street from each other. It seemed like they just always knew each other. As teens, they began dating and soon realized they desired to share the rest of their lives together. 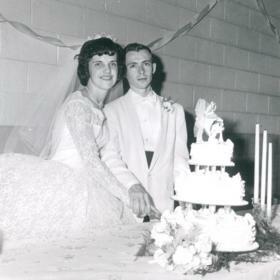 On June 10, 1961, Carolyn and Bruce married at Strathmore Methodist Church in Detroit in a ceremony performed by Dr. Smoot. The newlyweds first lived in Ann Arbor where Carolyn worked at Kroger Supermarket while Bruce attended medical school. When Bruce was drafted into the Army, they moved across the county and eventually settled in San Francisco where he was posted. 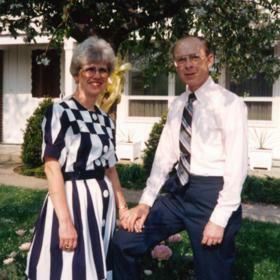 After Bruce completed his service, Carolyn and Bruce moved back to Michigan and settled in Kalamazoo in 1969. Carolyn and Bruce were blessed to become the parents of two children, Amy and Doug. Carolyn relished in motherhood and poured her heart and soul into providing a loving and supportive home for her family. She was a fierce advocate for her children and ensured their childhoods were rich in education, faith, and tradition. The family enjoyed traveling together and weekends were spent at their cottage on Pine Lake, where they often gathered to celebrate birthdays and holidays. Holidays were always large family gatherings centered in good food and good company. Not only was Carolyn invested in her own family’s good care, she also volunteered her time and talents to many local organizations. She worked for a time in the library at St. Augustine Elementary and poured much energy into many campaigns at the Greater Kalamazoo United Way over the years. Carolyn especially enjoyed planning the reunion of many of the families she grew up with on Asbury Park in Detroit. Carolyn and Bruce felt a strong call to share their blessings with others and were very generous. They felt most grateful to have the opportunity to take each of their nieces and nephews on a trip to Key Largo, Florida where they experienced the thrill of deep sea fishing. In addition to good meals and travel, Carolyn was always willing to share her love of Elvis Presley and Michigan football. A woman who unflinchingly lived her commitments, Carolyn was a dauntless source of loving care for many. 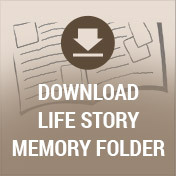 Carolyn lovingly cared for her husband during his battle with cancer ensuring as much comfort as possible. She also cared for her father, father-in-law, “Big Doug” and his wife, Eleanor as they grew older and needed assistance. Her friend Jack, whom she spent many good times sharing wild game dinners in Cadillac and trying out new restaurants, also benefited from Carolyn’s good care. And of course, Carolyn was devoted to the care of her daughter Amy.  It’s easy to see that Carolyn’s loving kindness provided much comfort for those she loved. Carolyn’s love radiated to those around her. She relished in caring for others, a good meal, ice cream cones, and a Wolverine win! Whether working her way through a sewing project, strategically planning a reunion, gathering at the cottage, or listening to Elvis croon a favorite song, Carolyn’s heart and thoughts were always centered around the well-being of others. There simply was no safer place for others to be than in Carolyn’s heart. A gift and a treasure, Carolyn will long be remembered in the fond memories of those who were blessed to know her. 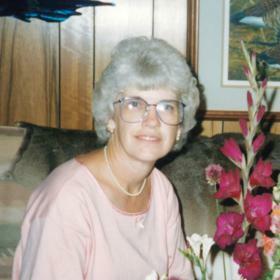 Carolyn Mesara, age 78, died September 9, 2018, in Portage, MI. She was preceded in death by her husband, Bruce Mesara and her daughter, Amy. 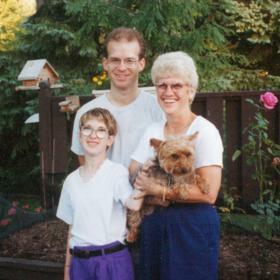 Carolyn is survived by her son, Doug (Jane Blyth) Mesara; and siblings: Donna (Phil) Renuart and David (Melanie) Pauch. Cremation has taken place. Visit with family and friends while sharing food and drinks on Saturday, September 22, 2018 from 5PM -7PM at the Betzler Life Story Funeral Homes, 6080 Stadium Drive; Kalamazoo (269) 375-2900. Please visit Carolyn’s personal webpage at www.BetzlerFuneralHome.com, where you can archive a favorite memory or photo of her and sign her online guestbook. Memorial contributions may be made to United Way of Kalamazoo.